Why PAY to Learn This? And if you'd like to learn how to "bend" notes on your harmonica — or how to do it better — you've come to the right place! Is THIS how you're supposed to "Bend" notes on a harmonica??? I could hear good players at jamm sessions and shows, and great players on recordings making this growling, biting, sound...but had no idea how they were doing it. I even thought they might be using a different type of harmonica than the boring sounding one I had! Or maybe it had something to do with using a microphone. I had NO CLUE! "Ya just got to do it." Or "Make the note go down in your throat." This was no help at all. I bought some harmonica instruction books which didn't help, either. Eventually, after many hundreds of hours of trial-and-error, I got my first, feeble bend (a weak two in bend on my old key of A Marine Band — I remember it like it was yesterday!). I went on to play pretty well, and in the process became a harmonica teacher (as well as other things, such as a cognitive scientist). Over a million people have learned to blow their blues away, through my books, recordings, videos, and in-person workshops and presentations. Once I started doing all this, I learned that one harmonica technique — known as "Bending" notes — is both the most important and the most difficult thing that anyone who wants to play good blues and rock harp must learn. So I started teaching specialized classes in bending, and have taught thousands of people to bend notes in person, through my private harmonica lessons and through my group workshops. Since I'm trained in experimental psychology, I've been able to hone my teaching methods, to make them as quick and effective as possible. After I got good at teaching people to bend, I began to put my methods into written and recorded form. I've taught over a hundred thousand beginning, intermediate, and advanced harp players to bend — or to bend better — with these methods, and have now finished my new third edition Bending The Blues Book and Two CD set. Whether you're a beginning blues player who just wants to get that one first harmonica note bend, or an advanced player who wants to learn difficult bending techniques like "multiple half-step harmonica bends" and "rock harp blow bends" and even "overblow bends" — please keep reading! And FYI: I was awful when I first picked up the harmonica. For years I had been told, and used to think, that I was "tone deaf," that I was a "musical idiot," that I "couldn't carry a tune in a bucket." 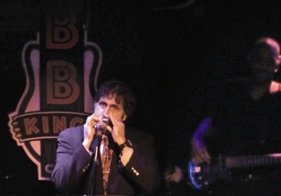 Now I love to play and teach harmonica — and you can do it, too! Need a general beginner's method for Blues and Rock Harp?